We covered Ubisoft's terrifying marketing ploy for Rocksmith two months ago. As it turns out, there was a much less scary marketing campaign going on all summer long. Van's Warped Tour 2011 has wrapped, but at all 44 locations rockers and wanna-bes alike had the opportunity to rock out using their 3DS. Rocksmith, the first and only game so far that lets you plug a real electric guitar into your console without using a MIDI converter. 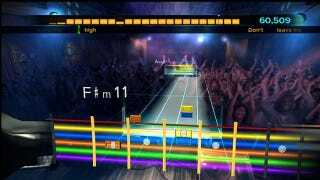 Other games have released with similar concepts, including Rise of the Six String and Rock Band 3's Pro Guitar controller, though Rocksmith is the first to encourage players to use a real electric guitar. A full hands-on demo was available at Warped Tour, which would have been pointless without some gear. Ubisoft partnered up with Ernie Ball, the world's premier string & accessory manufacturer, to bring the game to Warped crowds. "Liking" the game on facebook enters you into a contest for real-life rocker gear, including real electric guitars, a years worth of strings, and a Guitar Center giftcard. According to Ubisoft, the game "...adapts to the player's skill level from novices who have never picked up a guitar to the most experienced shredder." There are no details yet on how the game achieves this adjustment. Rocksmith launches this October.